The evening before the March For Our Lives rally in Washington, I was hard at work on my sign. Making a statement is important, but at the Women’s March last January, I discovered that a sign was invaluable for keeping friends together in a crowd. 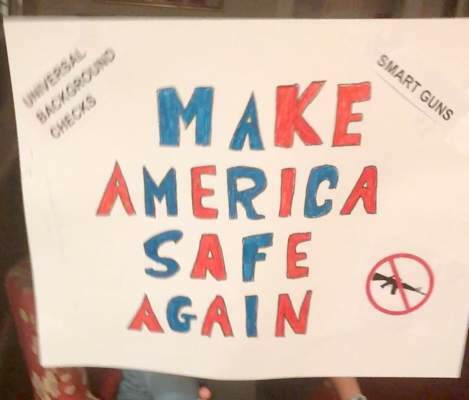 Since my Women’s March sign read “Make America Kind Again,” I opted to keep with the theme, and I created a “Make America Safe Again” sign for gun control. My daughter looked at my sign skeptically. “It’s too vague and nondirective,” she declared. Now challenged, I added the following directives: “Universal Background Checks,” “Ban Assault Weapons,” and “Smart Guns.” My sign was now complete. I was surprised when my daughter – our family Jeopardy! whiz – asked, “What’s a smart gun?” When we arrived to join friends, their daughter – a doctoral student – also looked at the sign and asked me what a smart gun is. I explained to both young women that a smart gun – like an iPhone – relies on a biometric such as a fingerprint so that it can be used only by authorized users. This technology would reduce the flow of firearms to illegal owners, prevent accidental discharge by children, protect rightful owners and law enforcement officers from having their own weapons used against them by criminals, and decrease the number of suicides by family members of gun owners. In my state of Maryland, there have been two school shootings, one as recently as March 20 , and both were committed by boys who took a parent’s firearm to school. The rest of the speakers were teenagers, all of whom had lost someone to gunfire. There were speakers from Parkland, Fla., who talked about the raw losses they were feeling, and the student who wasn’t celebrating his 18th birthday on March 24. Matthew Soto from Newtown, Conn., talked about losing his sister, a first-grade teacher, in the Sandy Hook shooting. But the rally wasn’t just about mass murders and school shootings: Zion Kelly talked about the death of his twin, a teen who was killed when he stopped at a convenience store on the way home from school in Washington, only to have his promising life snuffed out during a holdup. We heard about shootings in the bullet-riddled streets of Chicago and Los Angeles and the toll they have taken. The losses to gun violence have been felt most strongly in communities of color. While it was mentioned that the majority of gun deaths are suicides, there were no speakers from families of people who died from suicide. The final speaker was Emma Gonzalez , a young woman from Parkland who closed the rally with a powerful 6 minutes and 20 seconds of silence, the duration of the shooter’s rampage. The rally closed with a performance of Bob Dylan’s “The Times They Are a-Changin’ ” by Jennifer Hudson , whose mother, brother, and nephew were murdered by a gunman. The teens talked about what changes they wanted to see enacted. They talked about closing loopholes to background checks, and I was pleased that one young man specifically mentioned keeping guns from those who are violent, but did not mention mental illness as a reason to block gun ownership. A call to resume a ban on assault weapons was made repeatedly as was a call to raise the age (to 21) at which an individual can purchase a gun. Military-style weapons are not necessary for hunting or self-defense, and they enable the rapid-fire assassinations we have seen in mass shootings, so they remain an easy target of gun control advocacy. But in terms of numbers, these firearms are responsible for a small fraction of gun deaths. I was surprised, but the teens did not mention “smart gun” legislation as a way to reduce gun deaths. Guns, and gun deaths, are a part of American society. While the majority of Americans favor stronger regulation of gun ownership, legislation that would end gun ownership is not likely to go anywhere. Smart guns, however, are different. Forty percent of polled gun owners have said they would swap their firearm for a smart firearm. So given the appeal of a firearm that can’t be diverted or stolen, used against the owner, discharged accidentally by a child, or used for suicide or homicide by a distressed family member, why don’t these weapons exist for use by the American people? Numerous technologies exist, dating back to 1975, and the first fingerprint-enabled gun was invented by Kai Kloepfer , an 18-year-old high school student, in 2015. People want these guns and the protections they offer, yet they have never been produced and made available to either the American public or to our law enforcement officers. So where are these firearms, and why aren’t our Parkland teens asking for them? The answer to the first part of that question lies with the National Rifle Association (NRA) and the state of New Jersey. In 2003, New Jersey passed the Childproof Handgun bill , which requires that all guns sold in the state be smart guns within 3 years of their availability. The NRA has vigorously opposed any legislation that would require all guns to be smart guns. Because the availability of these weapons would trigger the New Jersey bill, California and Maryland have been prevented from importing smart firearms from a German company. Perhaps, however, New Jersey does not need to bear all the blame; in 1999, 4 years before the passage of the bill, the NRA and its members boycotted Smith & Wesson when the gun manufacturer revealed plans to develop a smart gun for the government. The NRA’s public stance is that it does not oppose smart guns for those who want them, but it opposes legislation that would eliminate the sale of conventional firearms. The organization has voiced concerns that technology fails and that it potentially slows down firing the weapon. It doesn’t talk about dead toddlers, or about police officers who’ve been killed when their weapons were taken from them. As for the Parkland students, I don’t know why they aren’t asking for smart gun technology while they have the attention of the country. Perhaps they, like the young women I was with, don’t know it’s an option. Perhaps it’s too removed from the issue of mass murders and an assault weapon ban feels more attainable. Or perhaps the NRA’s mission has too much of a stronghold in Florida. I don’t know why they aren’t asking for smart gun production, but I know they should be. Dr. Miller is coauthor with Annette Hanson, MD, of “Committed: The Battle Over Involuntary Psychiatric Care” (Baltimore: Johns Hopkins University Press), 2016. She practices in Baltimore.